Archives of Eaton Bray News for January 2015. This article was published in January 2015. Please see Latest News for more recent information. Eaton Bray Parish Council have sent the following to Central Beds Council regarding Planning Application CB/14/04055/OUT - land off Totternhoe Rd, Eaton Bray/outline planning 150 dwellings. We urge that if residents of Eaton Bray (and surrounding villages) wish to object to the proposed development they write to the case officer, details below, providing your reasons for objection. It is important that you send a physical letter or email as it is not enough to just make a comment on the CBC website. At the end of February, Central Bedfordshire Council will decide spending on local services such highways, care services, refuse collection and recycling, libraries and leisure as it sets the budget for the next financial year (April 2015 to March 2016). These decisions affect everyone and so we're seeking your views on a £186m spending package that will see more money spent in areas of greatest need. The draft budget proposes no increase in our share of council tax for the fifth consecutive year and protection of public facing services. It also proposes some efficiency savings to balance the books. This year's budget has been informed by a public consultation, which saw 2,500 residents share their views on the council's budget. And there is still time for you give us your views. Before having your say, you can find out information on our plans by visiting our website. There you will find links to the Budget 2015 leaflet and to the full Budget 2015 papers, which will be discussed at the Council's Executive meeting on 13 January. You can then have your say by completing the online questionnaire by 3 February, 2015. 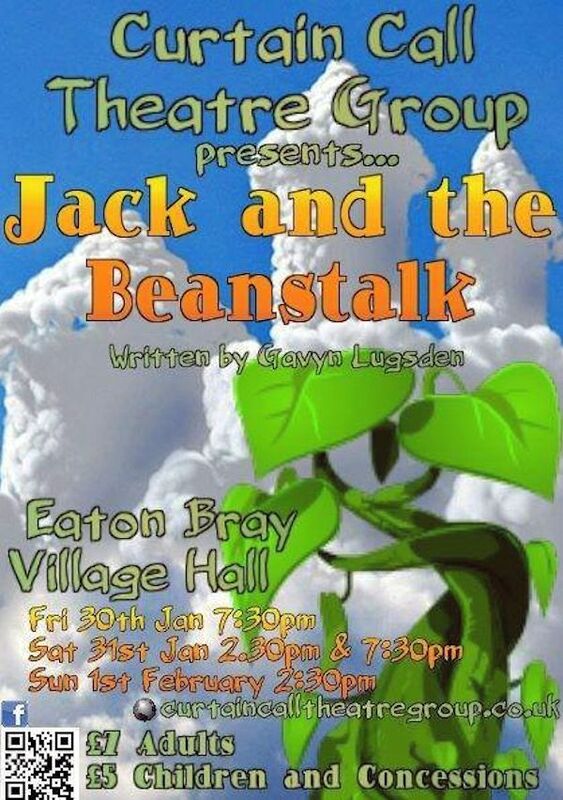 Curtain Call Theatre Group will be presenting Jack and the Beanstalk at the end of the month in Eaton Bray Village Hall. For booking details, please see their website curtaincalltheatregroup.co.uk. Sunday 1st February 2015 2.30pm. Tickets: £7 Adults, £5 Children and Concessions. You are viewing the January 2015 archive.